Josie has always brought home strays. Only now, the stray is an unwilling Australian. How do you relate to a man who doesn’t want you to? Josie Sergeant has learned one thing by carving out her living from the wilds of the Canadian north: perseverance, optimism and the willingness to do what has to be done can overcome even the harshest of obstacles. Life has taught Theo Sabich, a fellow rancher from Australia, that optimism is a fool’s hope. When their beloved siblings’ impetuous marriage plans pit Josie and Theo against one another to defend their families, they find more than they bargain for. And when they start seeing each other as more than enemies, they face their greatest challenge – finding the courage to reach out for happiness. Under the northern lights, their attraction ignites beyond their control… The trouble is a one-time “no strings attached” release of passion is easier said than done when love is hanging by a thread. 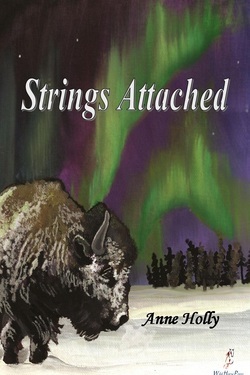 Strings Attached is a full length contemporary romance novel by Canadian writer Anne Holly, and will release in e-book format by American publishers Wild Horse Press in May 2011. Strings Attached is available for purchase through several mainstream venues, and is available in PDF to reviewers upon request. It may be released in paperback at a later date. Set in the north of the Canadian province of Manitoba, along with segments in Australia, the book focuses on the lives of two dedicated ranchers, and deals with themes of loss, courage and healing after tragedy and emotional trauma, and draws on research into the realities of postpartum psychosis and the ranching industry. Cover art by American artist Amanda Wood. Anne Holly is a Canadian author of holiday fiction, romantic erotica, contemporary romance and womens fiction, as well as a freelance academic and humor writer. Her fiction has been published by three publishing companies, and is available through Amazon. Holly teaches at the university level and holds a graduate degree in cultural studies. She spends her time writing, reading and being a mother. She was born in rural Nova Scotia, but currently resides in Ontario. Her work has been called "mesmerizing" (Manic Readers) and praised for its emotional depth and "truth" (Coffee Time Romance). Anne Holly's work relies more on internal than external challenges, and has a particular preoccupation with the emotional risk and healing to be found in mature love. For interview requests or questions, please email Anne at anneholly2010@gmail.com. Strings Attached is available in PDF at no charge to age-appropriate review sites and blogs. Please email anneholly2010@gmail.com for more information or to request a review copy. Please visit http://www.anneholly.webs.com/ for more info.